It is one of the most utilitarian spaces in any home. Most don't give it a designing thought. After all, it isn't high on most of our "want to do" lists. 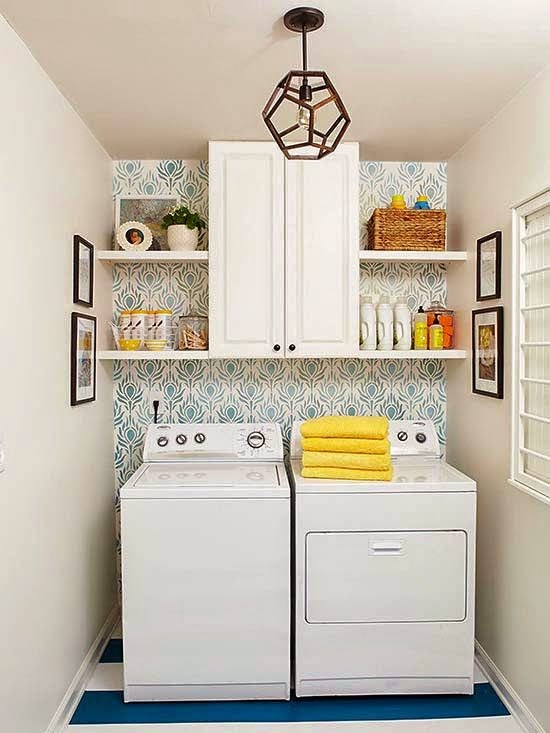 Yet, the laundry room can be one of the most fun spaces to decorate! Interestingly, today's featured space is one of the most pinned rooms from my Pinterest profile! The laundry space above isn't glamorous or glitzy (much like doing laundry), but it is functional, organized, and inviting! Laundry is one of the necessary tasks we do in life, so we may as well make the most of the dedicated space and pretty it up! From a decor perspective, I love how one wall was wallpapered. It makes a great design focal point, and it also brings in color, texture, and pattern. I especially love the striped floor. It adds great linear and graphic impact, as well as color, repetition, and more pattern. The textural, geometric ceiling lighting fixture, and practical, colorful accessories are the perfect finishing touches to soften the space! Have a great weekend, everyone! Starting next week, I'll be sharing some personal glimpses into summer living around here. :) See you back here on Monday.